3 Are you reading these minutes? Are you reading these minutes? These will be now done by the CWG - interview style. GroupTweet - Allows people to tweet as @openstreetmap, without having access to the password for that account. Additionally, one can see which account published any @openstreetmap tweet. In October - exact date to be determined. 21:03:21 dorothea_	shall we wait a couple of minutes or start? 21:10:26 dorothea_	any action item updates..? 21:10:37 chrisfl	Sorry on now. 21:16:29 dorothea_	how about we contact each company, tell them about the blog post and just ask them to write to us why they joined ? 21:17:02 peda	hm, sounds interessting. Perhaps even a bit like an interview? 21:19:02 peda	ok, so let's do that. We can open a new pad and collect some ideas,..
21:20:34 peda	any other updates re Action items? 21:26:23 dorothea_	if noone else has any other updates, shall we proceed..? 21:28:31 dorothea_	how much, approximately? 21:29:27 dorothea_	Zverik, this year the award was paid by the CWG, wasn't it..? 21:30:52 dorothea_	hbogner, Tordanik1 what do you think..? 21:33:33 hbogner	and as i read there is a talk about osm awards, and it would be from cwg? 21:37:55 chrisfl	When I have had stickers printed, the cost has been relatively small. 21:38:19 chrisfl	4k would be more that enough. 21:39:08 chrisfl	Might make sense to work out what/how much and base budget from that. 21:40:10 peda	well, imho we tried that last time and almost no one participated in getting prices,..
21:45:19 dorothea_	talking about the budget, I was wondering if anyone has any objection for the costs of the stickers for SotM and SotM-Asia to be taken from the 2017 CWG budget..? 21:45:40 peda	so what do we do? defer? Request 4k (my suggest)? something else? 21:50:07 dorothea_	hbogner, Tordanik1 , chrisfl , Zverik..? 21:50:37 Tordanik1	Good plan as far as I'm concerned. 21:55:10 dorothea_	peda, will you contact Frederik..? 21:55:58 hbogner	representing OSM/OSMF at local tech conferences is CWG or LCWG task? 22:04:30 peda	can we move on? Sending stickers? 22:05:33 dorothea_	shall I contact the first or both? 22:06:57 peda	hm, Tordanik1, isn't Polyglot attending FOSS4G in Belgium?! 22:08:26 Tordanik1	Probably, although I'm not 100% sure. 22:14:38 peda	but I might at least write something for the German blog .. or perhaps a diary entry?! 22:18:44 peda	last topic? or is there anything else re membership drive? 22:20:55 dorothea_	I've updated it on the pad.. are we missing more? 22:22:09 dorothea_	chrisfl, hbogner , Tordanik1 and Zverik can you have a look at the list as well..? 22:23:11 Tordanik1	Doodle? Externally hosted and closed afaik. 22:23:51 dorothea_	I have found a foss one, but it has an issue with different timezones..
22:26:14 peda	and I'm not sure if we were supposed to also name opensource software we use? 22:26:51 dorothea_	I think it was just non-FOSS? 22:28:09 peda	will you do that or should I? 22:29:56 dorothea_	I think that's it.. does anyone want to discuss something else? 22:30:48 peda	again via doodle? or should we try to get back to a fixed scheme? 22:32:03 dorothea_	maybe doodle again for the 3rd week? 22:34:06 peda	will you do the doodle work? 22:44:56 peda	btw, do we have pinterest?! 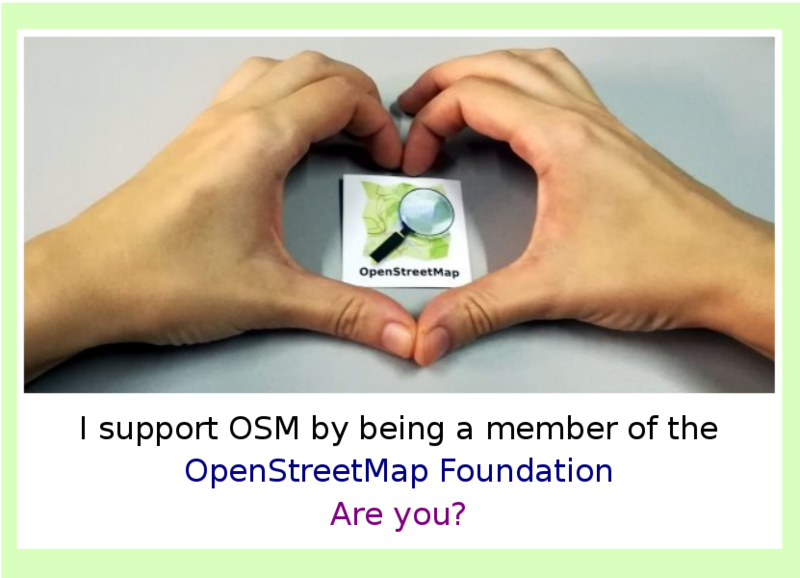 22:47:31 dorothea_	"The official OpenStreetMap' pinterest account was created and is managed by the OSMF Communication Working Group." This page was last edited on 1 October 2017, at 22:33.